A new book reveals how you can reach your dream of getting paid to play Hello Kitty Adventure. Every gamer probably has at one time in their life wondered if he or she could take their hobby and turn it into a lucrative, enjoyable career. 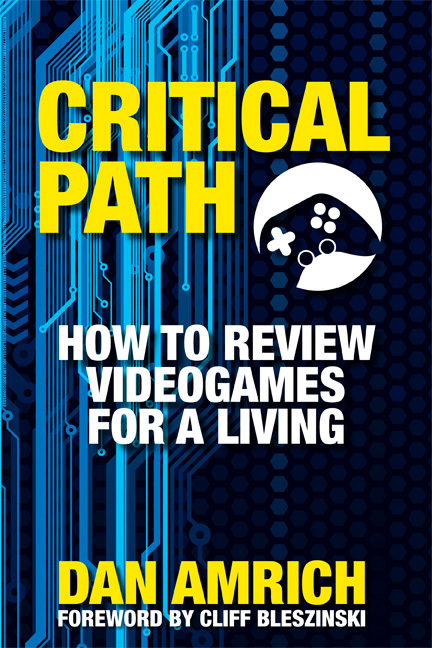 A new book, titled Critical Path: How to Review Videogames for a Living, aims to help those who want to try their hands at the not so lucrative, but still very much enjoyable profession of game reviewing. Written by Dan Amrich, former Senior Editor of GamesRadar and Gamepro, Critical Path details several important aspects of professional game reviewing. Its six chapters cover topics such as how aspiring reviewers can build their writing skills (which are incredibly important to have), approach media outlets for freelance assignments, and build up a good reputation with game publishers so they hook you up with free games and swag instead of restraining orders. In addition, Amrich also discusses several myths of being a game reviewer and how they compare to cold, hard reality, and provides some important advice on how to avoid career-ending mistakes (and what to do if you end up making them anyway). Dan Amrich started reviewing videogames in 1993, and has been featured in Wired, PC Gamer, GameSport, and many other national publications. He is also the author of 2006's Playstation 2 for Dummies and the former Editor-in-Chief of World of Warcraft: Official Magazine. Currently, Amrich works as Social Media Manager for Activision in Los Angeles, California. He'll be appearing alongside The Escapist's own Susan Arendt on April 6th at PAX East for PAX Game 2012, hosted in the Manticore theater at 6pm. Critical Path is available in both digital and print formats from Amrich's website.